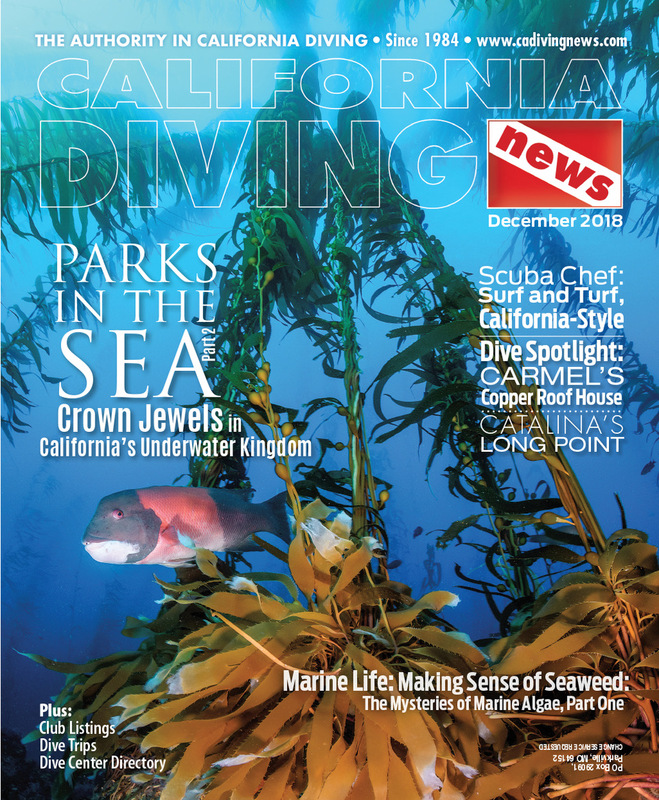 ‘What is the best dive in Monterey Bay? What is best? Best for photography? Easiest entry? Most diverse marine life? Not an easy question… No easy answers… One way to address the question is to listen to what the experts say. Lynn May, the original owner of the Silver Prince dive boat, could dive anywhere he wanted. 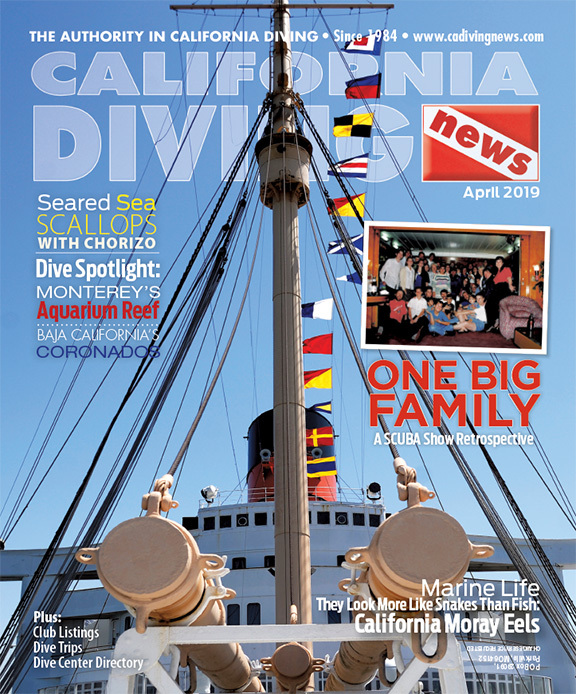 He claimed that the best dive in Monterey Bay was the Municipal Wharf II. Wharf II was actually inspired by an accident. On March 3, 1923, the largest load of sardines ever to be shipped from Monterey, 20,000 cases, was on Fisherman’s Wharf ready to be loaded on the S.S. San Antonio. High wind and seas pushed the San Antonio into Fisherman’s Wharf, causing a large portion of the wharf to collapse, with over 10,000 cases of sardines spilling into the harbor. The incident prompted the City of Monterey to commission a second, sturdier commercial wharf, which was completed in 1926. 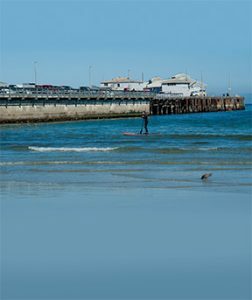 Today, Wharf II is an active fishing pier, home to fish markets, an abalone farm, restaurants, and the Monterey Peninsula Yacht Club. It is also where commercial fishing vessels land their catch. The wharf is composed of three sections. The nearest to shore is a concrete structure. This is followed by a section of wooden pilings, and another section of wood pilings that turns about 30 degrees to the west. The concrete wall and pilings are full of life from the water line all the way down to the seafloor. The concrete wall and pilings of the wharf provide a habitat for a wealth of marine life. Some are completely covered with a lush carpet of strawberry anemones. Individual colonies may be fluorescent red, bright orange, lavender or even shades of pink. Members of a colony show the same color, and colonies of different colors cover some pilings in a mosaic pattern. Other pilings are covered with a lush carpet of snow-white Metridium anemones, while others are covered with green, aggregating anemones. Among the anemones hide an assortment invertebrates and fishes. Large sheep crabs hang upside down, and you’re likely to spot a small, red octopus or two. Numerous shrimp and hermit crabs scurry under the cover of anemones. While the encrusting invertebrates add color to the pilings, the nudibranchs are the real headliners here. Look for common nudibranchs like the Hilton’s nudibranch feeding on bryozoans, Spanish shawls feeding on hydroids or tunicates, or the more common dorids feeding on sponges. There are also plenty of unusual nudibranchs here as well. Over the past several years divers have found numerous Janolus nudibranchs on the wharf and harbor pilings. These are members of the Arminidae suborder and this family is only represented by seven species in California. Divers will also find navanax. These are not true nudibranchs because their gills are covered with a fleshy flap, but they do prefer to dine on a number of species of true nudibranchs. While the concrete wall and pilings get most of the attention, divers should also check out the bottom east of the wharf. Huge beds of sand dollars occupy the near shore areas, while tube-dwelling anemones may be found a bit deeper. These are normally found with red rainbow nudibranchs, who feed on these anemones. The calm waters to the east of the wharf provide a nursery for many of the larger fish. There are normally a number of young-of-the-year lingcod here, but don’t expect to find any of legal size, so this isn’t a hunter’s paradise. It is, however, a pretty good spot for fish portraits. You can expect to find cabezons, various species of flatfish, kelpfish, rockfish, and rays. Hunters occasionally encounter a rather large halibut or two during the spring and summer months. When the seas are up and you are looking for a calm, relaxing dive, this is your spot. However, macro photographers and nudibranch lovers will go gaga over this site. And when the diving’s done there are topside attractions to enjoy. Special Rules Decades ago divers were permitted to dive underneath the Wharf II with permission of the Harbormaster, but this is no longer true. The area around Wharf II is owned by the City of Monterey and the Harbormaster controls diving there. Diving in buddy teams is allowed along the concrete wall and outside of the wharf pilings. 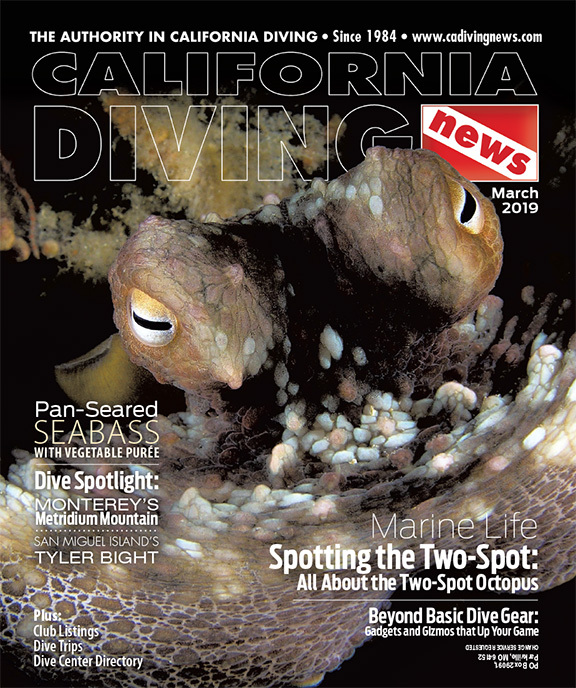 Diving groups are allowed, but it is recommended that a topside-spotter be with a dive team to warn fishermen of divers and call the Harbormaster if there are any problems during the dive. Diving is permitted along the fender pilings, but not under the wharf or inside the harbor. The fender pilings are separate from the structural pilings that support the wharf, and are there to prevent boats from striking the wharf and causing another “accident.” The Harbormaster Office recommends that you call them at (831) 646-3725 or 3950 before you suit-up, to notify them that you will be diving. 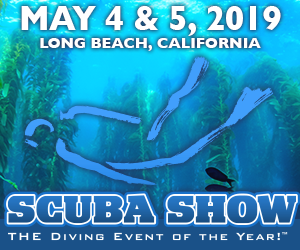 It is recommended that divers not dive beyond the “dogleg” bend in the pier since boat traffic and overhead activities make this area more hazardous. Please notify the Harbormaster when you complete your dive. I have seen this pier named Wharf #2, Wharf 2, and Wharf II; Wharf II is how it is spelled on the City of Monterey’s website. Skill Level: Beginner or better. Location: In the Monterey Harbor complex, at the end of Figueroa Street. Access: Park in a metered spot metered at the foot of Wharf II or in the nearby fee lot. It is a short, level walk to the beach. Facilities: Restrooms are available below the Harbor Master’s office. There are plenty of restaurants within walking distance, and five dive centers a short drive away. Entry and Exit: Enter off the sandy beach just to the right (east) of the wharf. Conditions: Predictably very calm. This is the most protected entry in Monterey. Photography: Great macro photography for nudibranchs, other invertebrates, and small fish; wide angle of wharf pilings. Hunting: Hunting is permitted east of the Wharf. You might find a few dinner-worthy halibut here, but otherwise this is a nursery. Cautions: Do not dive under the Wharf or in the harbor; see main text. Watch for boat traffic. Risk of entanglement in fishing line, so carry a knife or cutting tool.